Our spacious room had a comfortable canopy bed, kitchenette, and large bathroom. The grounds offered a private feeling, yet easy access to the beach, and their spa gave wonderful massages. The restaurant was accommodating and their staff was friendly. Where to find Broome hotels near an airport? Where can I find hotels in Broome that are near tourist attractions? 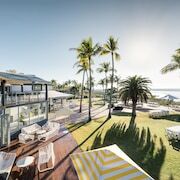 Short- and long-stay accommodation options are aplenty in Broome. Our database shows at least 29 places to sleep within a 0.1-kilometre (0.06-mile) radius of Broome's center. 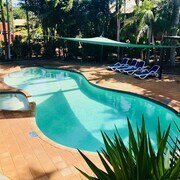 Astute vacationers who fully appreciate the convenience of finding a hotel in the heart of town should check out the Moonlight Bay Suites and Mangrove Hotel, which are located within 1 kilometre (0.6 miles) of Broome's downtown area. Cable Beach, a popular Broome hotel area with 17 Expedia-listed establishments is 4 kilometres (2 miles) away. 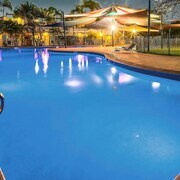 The Cable Beach Club Resort & Spa and Seashells Broome are amongst the accommodation options in Cable Beach. Budget-concious travelers rejoice! 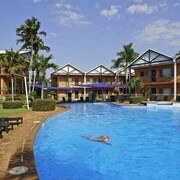 The Broome area provides loads of economical hotel establishments. 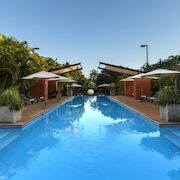 2 kilometres (1 mile) away from Broome's downtown area you'll find the Oaks Broome. The Broome-Time Accommodation is just 2 kilometres (1 mile) away. Some more options in the cheaper range of Broome accommodations include the Cable Beachside Villas and the Broome Beach Resort. 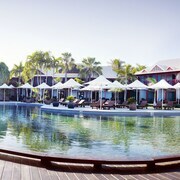 The Bali Hai Resort & Spa is 4 kilometres (2 miles) from the center of Broome. Or, alternatively, the Kimberley Sands Resort & Spa Cable Beach is positioned 3 kilometres (2 miles) away. Another possibility is to check out the amenities and rates at the The Pearle of Cable Beach or the The Billi Resort. Why not see some more of the beaches that are found in The Kimberley? Choose to spend a few extra nights in some of the other parts of The Kimberley. Whether you engage in popular regional activities, for example rock climbing and mountain climbing, or travel around to explore the attractions, you will be able to reserve suitable accommodation in the area. Broome International Airport is 1 kilometre (0.6 miles) away from Broome. Visitors who choose to stay close by, can easily secure a room at the Oaks Cable Beach Sanctuary or Pinctada McAlpine House. What are the most popular Broome hotels? Are there hotels in other cities near Broome? 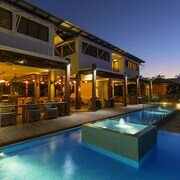 What other types of accommodations are available in Broome? Explore Broome with Expedia.ca’s Travel Guides to find the best flights, cars, holiday packages and more!